Visiting a site with Java enabled content you may see this prompt, confirming if you want to run the JRE code located on that location. Setting up these couple of settings will get away this prompt. First add the location in the trusted sites in exception list. 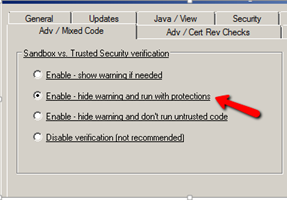 Then set the “Enable – hide warning and run with protection” under “Sandbox vs. Trusted Security verification”. 01: Admin Console (Item Level Targenting): Why would I want to bypass Internal (pre-defined) Item Level Targeting? 03: Chrome: How do I manage certificates with Google Chrome? 04: Chrome Policies don’t appear to work when using PolicyPak Cloud. 05: Chrome: How do I manage the Proxy settings for Google Chrome? 06: Chrome: How do I block Local File access to Google Chrome with PolicyPak? 07: Chrome: Why do I have extra tabs appear when I open Chrome on an endpoint? 08: Chrome: Why Homepage button URL is not working for Google Chrome? 09: Firefox: How do I troubleshoot adding Certificates with PolicyPak and Firefox? 10: Firefox: How can I deliver Certificates to “Certificate Authority” store and select “websites”, “mail users” and “software makers”? 11: Firefox: How can I prevent both automatic AND manual updates for Firefox? 12: Firefox: How can I use PolicyPak to revert Firefox’s Options back to the “Old Style” ? 13: Firefox: How do I use the NTLM passthru (URIS) settings in the Firefox / about:config Paks? 14: Firefox: What versions of the PolicyPak CSE support managing certificates in what versions of Firefox? 15: Firefox: Can I enable / disable add-ons for Firefox? 16: Firefox: Can I deliver, manage and/or revoke certificates directly to Firefox? 17: Can I use Security.enterprise_roots.enabled as an alternate method for FF + Certificates? 18: Firefox (and Java and Thunderbird): Why can’t I seem to find (or perform) UI lockdown for Firefox, Java or Thunderbird ? 19: Firefox: Is PolicyPak compatible with the Frontmotion packaged MSI version of Firefox? 20: Firefox: Is PolicyPak compatible with Firefox when installed to non-standard (and portable) locations? 21: Firefox: Is PolicyPak compatible with Firefox ESR? 22: Firefox: How do I set “Allow Now”, “Allow and Remember” or “Block Plugin” as plug-ins are requested? 23: Firefox: How do I stop the “Firefox automatically sends some data to Mozilla so that we can improve your experience” message? 24: Firefox: How can I fix Dark Theme / Firefox 56 when using PolicyPak ? 25: Firefox: Why doesn’t the Firefox Applications Handler function work as expected? 26: Firefox: Why don’t I see Bookmarks and Pop-Ups settings set when user has NEVER run Firefox before? 27: HowTo: What do I do if I find a problem with a preconfigured Pak? 28: HowTo: One of my Pak entry’s settings is not getting delivered on target machines. What should be the first thing to look into? 29: HowTo: Which "side" of GPO should I deploy Paks to: User or Computer side? 30: Internet Explorer: I’m trying to use IE 11’s Enterprise Mode, but it doesn’t appear to be working? 31: Internet Explorer: Can I enable / disable add-ons for Internet Explorer? 32: Internet Explorer: Can I deliver, manage and/or revoke certificates directly to Internet Explorer? 33: Internet Explorer: How do I deploy custom settings to zones? 34: Internet Explorer: When should I use Compatibility mode vs. Enterprise Mode for IE 11? 35: Internet Explorer: Why don’t HTTP sites get added to the Trusted Site list? 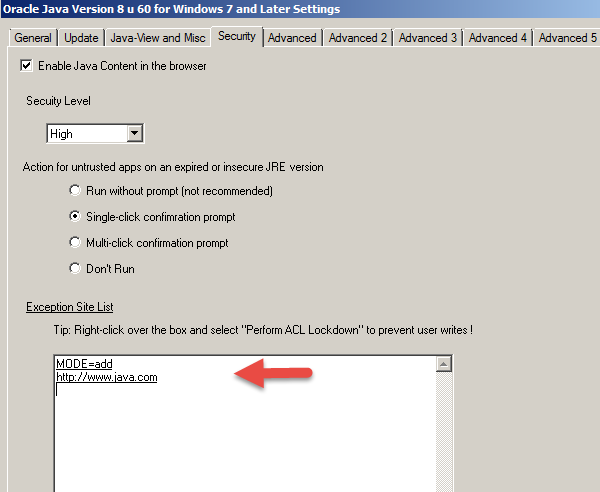 36: Internet Explorer: Why does IE fail to launch after I apply ACL lockdown or all of the IE Pak STIG settings? 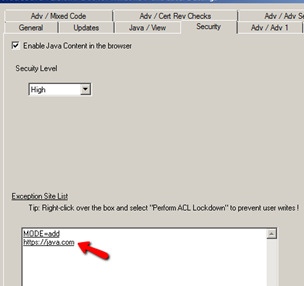 38: Internet Explorer: Why Internet Explorer is not launching after I apply “Perform ACL Lockdown”? 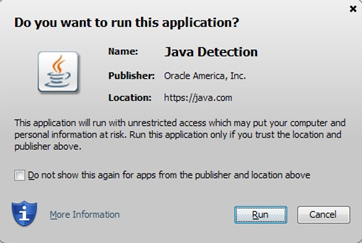 39: Java: Using the Pre-configured Pak for Java, how do I prevent “Java has discovered application components that could indicate a security concern.” Pop up? 40: Java: How to disable prompt “Your Java version is out of date.”? 41: Java: How to disable prompt “You Java version is insecure”? 43: Java: How to disable User Account Control prompt for Java Auto Updater? 44: Java: How to disable Task tray notification balloon events? 45: Java: I don’t see that any changes are working at all. What can I try first? 46: Java: Java Site List Exceptions just stopped working. What can I do to fix this? 47: Other: What is “Internal (pre-Defined)” Item Level Targeting? 48: Other: Is “Internal Item-Level Targeting” on by default? 49: Other: I added a Pak and some items are grayed out / not available. In other Paks, everything seems available. What’s happening? 50: Paks: Why are there some areas of the pre-configured Paks greyed out or not accessable? 51: Paks: Why do some Paks have pre-defined Item Level Targeting for an EXACT version number, and others say “Version 7 to 99” (or similar)? 52: Paks: What is the official support policy for the pre-configured Paks? 53: Paks: How will I know that an existing Pak will work with the version of the application I have today (and tomorrow)? 54: Paks: How often do the Paks for specific apps get updated?